President Donald Trump’s suggestion that children brought to America illegally get legal status only as part of reforms by Congress to immigration law sounds like good news, Republican lawmakers told The Daily Signal. “What I think you are going to see is with DACA being gone, it gets rid of the magnet of drawing people over here, thinking they are going to come in and get amnesty,” Rep. Ted Yoho, R-Fla., said in a phone interview Wednesday with The Daily Signal. Trump signaled that he could support passage by Congress of amnesty for those brought here illegally as children. Trump signaled Tuesday that he could support passage by Congress of amnesty for those brought here illegally as children. 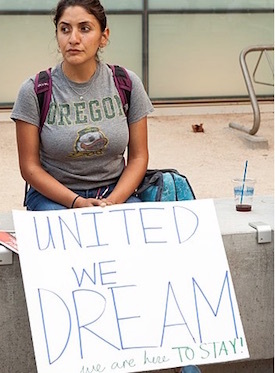 He did so shortly after Attorney General Jeff Sessions announced an incremental end to President Barack Obama’s unilateral protection for them, known as Deferred Action for Childhood Arrivals, or DACA. Under DACA, about 800,000 of this illegal population — whom some call “Dreamers” — applied for work permits and remained in the country without fear of deportation. A process could be worked out so children brought here illegally and who otherwise aren’t law-breakers may attain legal status, he said. But Rep. Matt Gaetz, R-Fla., told The Daily Signal in a phone interview that he would not back an amnesty initiative. Gaetz credited Trump’s progress in tougher enforcement of current immigration law. The Washington Times and other outlets reported in May that illegal crossings of the southwestern border had decreased by 76 percent since Trump was elected president. Rep. Andy Harris, R-Md., appeared to agree with Gaetz’s position. “I hope that the outcome is not a blanket amnesty, because I think that a blanket amnesty would be the wrong way to resolve an issue of people who come to this country illegally, and furthermore would encourage more parents overseas either to bring individuals over illegally or to just send their children over,” Harris said in a phone interview. Yoho said he envisions addressing the illegal population as a process, perhaps beginning with those who arrived as children. And if during that time they run afoul of the law, they’ll have to deal with that. If it is a serious penalty, they’ll be deported. And then those people who go through that five-year probationary period, they would get a more permanent status until this would afford a person a way that they could stay in this country legally. But our recommendation would be for those people that stand up and identify themselves, there will be a fine paid, a background check will be run on them, and that gives people a chance to identify themselves so they can get a legal status. Rep. Dave Brat, R-Va., said reforming the education system and improving the labor market are part of the immigration solution. If you think about immigration, the fundamental issue at stake is jobs. And so then, if you think it through, you say, ‘We have major problems in the labor market, right?’ Even though the unemployment rate is low, say they can’t find any skilled work, you say, ‘So why is that?’ Because we have a K-12 education problem, and we need to solve that. Another part of fixing the immigration system is implementing programs such as E-Verify, Brat said. Under E-Verify, employers would electronically check the immigration status of workers. In a statement provided to The Daily Signal, Sen. David Perdue, R-Ga., said legislation he introduced in February with Sen. Tom Cotton, R-Ark., would help address illegal immigration as it emphasizes merit-based legal immigration. Trump has come out for the bill, called the Reforming American Immigration for Strong Employment Act, or the RAISE Act. The RAISE Act’s changes to our legal immigration system should be part of the solution. I will continue working with Senator Cotton and my colleagues to advance this merit-based system that is pro-worker, pro-growth, and proven to work. In a Facebook post Wednesday morning, Rep. Jim Jordan, R-Ohio, commended the president’s action. He wanted a responsible timeline for winding things down, and he put the issue rightly back in the hands of Congress. Now we have time to have this debate, and I’m hoping the end result will be something consistent with what we told you all when you sent us here. Rep. Jim Banks, R-Ind., said he thinks Congress will act on the situation of this population, but likely not this month. they have been doing is collecting a paycheck !! If you have any Felonies then you automatically get deported, NO second chance ! !